When I first popped in this disc, I immediately thought of Jesus Lizard fans listening to way too much punk. A week later I changed my mind. 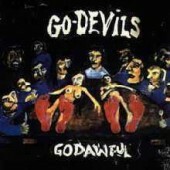 Compared to David Yow and company, the Go-Devils are extremely unsophisticated and sloppy. 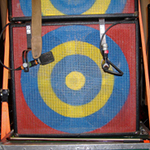 God Awful is the kind of heavy-guitar-based album a label like Amphetamine Reptile puts out. With its not-so-pleasant mixture of dirge/grunge, Southern-guitar groove, and scratchy-throat singing—and song titles such as “Crack Baby,” “U Make Me Sick,” “Affliction,” and “Can’t Get High Enough” —and the sick cover art, the Go-Devils are downright appalling. This band is perfect for slasher-film fans.